Spring is here! Warm weather, sunshine and riding motorcycles. I have a new toy, the 1400 Intruder. I’m enjoying riding her, around the side roads. I found her down in Alabama on Craig’s list. Made great friends with the guy I bought her from and his wife. They went out riding with us around an area called the Canyons. I ended up getting a battery for her, she just didn’t quite have enough to start on those freezing cold mornings when I get off work at 5a.m. This weekend my FBGz motorcycle friend, Sandi helped me put the new battery in. It is not under the seat like my Vulcan was. It is actually down in front of the back tire. If you look at the picture really close you’ll see a black box in front of the rear tire. That houses the battery. We also wired the power outlet for my phone charger. It is tucked right in on the frame of the windshield. 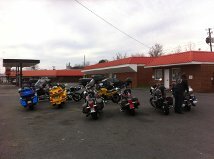 Sat, I rode down and met Sandi part way toward Chattanooga and we were able to ride some. I love going through the Confederate memorial park up in Fort Oglethorpe area of GA. We rode again today after my motorcycle maintenance experience. LOL We found the Alabama Highway 151 that travels down across farm land, horse farms, hay pastures and wonderful rural countryside. 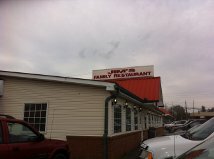 We found a Family Style restaurant down in Summerville. They had great food. Jimmy’s I think is the name of the place. We knew it had to be a good place. Big crowd of folks out riding today. We’re planning a ride to camp out toward the end of the month. It will be a trial run for the five day campout riding the Natchez Trace Trail later this spring. I’m finding that riding helps me find that quite place inside my head to relax and think. I can rest my voice before beginning the next narration contract. LOL And it gives me time to plot and plan for some of my writing and stories. 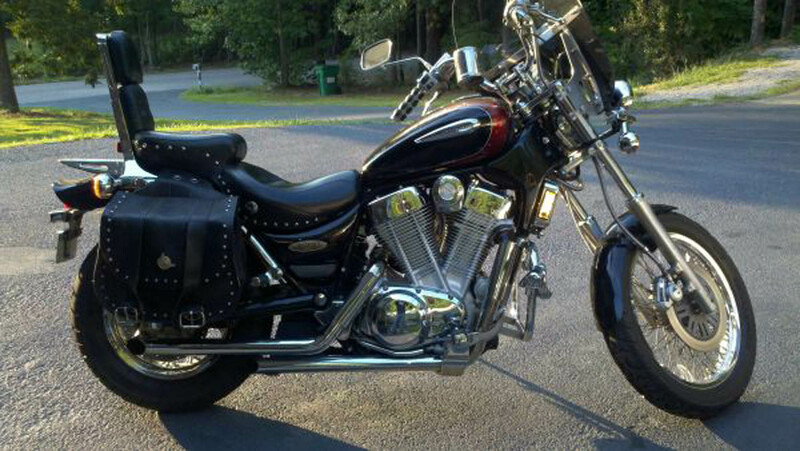 We also plan a trip riding the Blue Ridge Mountains later this summer. I’m really looking foward to the adventures in riding. You have to find the ways to re-energize your soul. This seems to be mine, now. This Intruder is a very balanced ride. Just awesome. I’m really looking forward to adventures with her.